After the huge success of the live action version of Disney’s Beauty and the Beast, there is another coming on the way a live action version of Aladdin. Everyone’s favorite Disney cartoon, from the story to the amazing songs… I am sure this live action movie will be amazing. Now the casting is complete and production is currently underway at Longcross Studios outside London. The cast members include Will Smith (“Genie”), Mena Massoud (“Aladdin”), Naomi Scott(“Princess Jasmine”) and Marwan Kenzari (“Jafar”). Casting for “Aladdin,” the live-action adaptation of the studio’s animated classic, is complete and production is currently underway at Longcross Studios outside London. 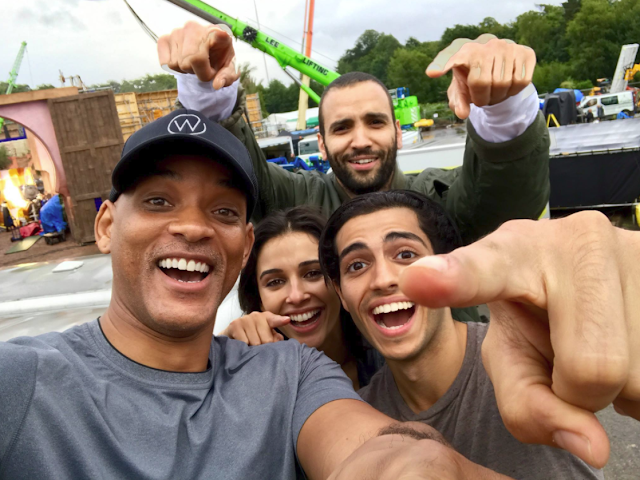 The “Aladdin” cast includes: Two-time Oscar® nominee Will Smith (“Ali,” “Men in Black”) as the Genie who has the power to grant three wishes to whoever possesses his magic lamp; Mena Massoud (Amazon’s “Jack Ryan”) as Aladdin, the hapless but lovable street rat who is smitten with the Sultan’s daughter; Naomi Scott (“Power Rangers”) as Princess Jasmine, the Sultan’s beautiful daughter who wants to have a say in how she lives her life; Marwan Kenzari (“Murder on the Orient Express”) as Jafar, an evil sorcerer who devises a nefarious plot to unseat the Sultan and rule Agrabah himself; Navid Negahban (“Homeland”) as the Sultan, the ruler of Agrabah who is eager to find a proper husband for his daughter, Jasmine; Nasim Pedrad (“Saturday Night Live”) as Dalia, Princess Jasmine’s hand maiden and confidante; Billy Magnussen (“Into the Woods”) as Prince Anders, a suitor from Skanland and potential husband for Princess Jasmine; and Numan Acar (“Homeland”) as Hakim, Jafar’s right-hand man and head of the palace guards. What do you think of the cast of Aladdin? Are you excited to see this movie? The cast of Aladdin seems wonderful. I think I would really enjoy seeing this movie!